Especially enjoyed Yatsusankan hotel near Takayama. 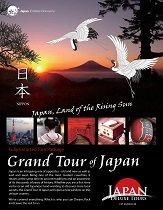 Also especially Grand Pacific Le Daiba in Tokyo and Kyoto Tokyu Hotel. They are beautiful, clean, lovely atmosphere. All meals provided were outstanding. Delicious breakfast buffets. All the omakase meals (lunch and dinner) were delicious. Buffet lunches also delicious and Bento Boxes too!! Tour guide Michiko-san was informative, organized and friendly. She answered our questions politely and always tried to make us feel we had input and cared for our needs. Visiting so many cities and the important sights was very well organized in this Japan tour. I only wish we had more time at Himeji Castle, the garden at Kenrokuen and more time in Kyoto. The highlights was day 8 and 10. Also loved Ninenzaka in Kyoto on Day 7. I didn't enjoy Yokagura on Day 4. Takachiho Gorge was very physical activity - Not for everyone's ability.